It starts with anything. It could be a computer or a melodica. Including the Apple Computer volume “quacks” that are all too familiar, the first seven seconds of Wise Up Ghost sum up the record. It speeds up, slows down and moves backwards. These seven seconds are what this record actually is: a marriage of new and old. Elvis Costello and The Roots are both connoisseurs of the underground. They’ve both waded through rough patches and had aces. They know what will work, even when “Sugar Won’t Work” and they are willing to test any and all waters. Which makes for a great record. They both come from completely difference sections of the store (and the world). They’ve shape-shifted themselves and their genre. Neither act has ever been afraid of asking questions. From their high quality records, they demand a high quality audience – they want us to ask questions too. The Roots have earned their gold stars as one of the best and innovative hip hop acts we’ve seen. Philadelphia has watched them work from the streets to national television. (It also goes without saying that if you haven’t read Mo’ Meta Blues: The World According to ?uestlove you’re doing yourself a disservice. It’s a must read for any fan of music, at any age, and every Philadelphian.) Their catalog of eleven records over eighteen years is a favorite for hip-hop heads and soul mates the whole world over. The Roots are a staple, I’m not sure there’s any other way to say it. From the start Costello has been our cult hero, encouraging us to buckle our knees and fashion thick glasses since ’77. He’s released twenty-four studio albums, guided us into New-Wave and brought the organ to the front. He’s worked with artists from Richard Harvey to Burt Bacharach. Wise Up Ghost itself is a fusion of genres. Hear it on “Wake Me Up” with the smooth Rhodes hook and “a slap of a kiss.” There are strings on “Refused To Be Saved” and chimes on “Tripwire”. “Stick Out Your Tongue” winds up and let’s loose. “Come the Meantimes” will nod your head and quicken your pace. The smooth, muted trumpet hook on “Viceroy’s Row” glides and glows. The Roots have brought their A game, again, and Costello is at ease. “Walk Us UPTOWN” was originally released as a Record Store Day single and turned into the full-length, Wise Up Ghost. The Roots have backed Costello three times since becoming the house band for Late Night With Jimmy Fallon in 2009. While Costello is happy to weave in and out of steady releases, it shouldn’t come to a surprise that The Roots are working on their own record for later this year, or early next – & Then You Shoot Your Cousin. But I have a feeling we’ll be fine until then. 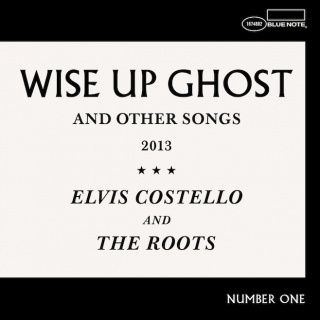 Wise Up Ghost is a perfect fall record. As a perfect soundtrack to the change of season, keep it on heavy rotation for the coming weeks. It’s a smorgasbord of sound. Nothing on this record is black and white, except the cover, homage to the City Lights Pocket Poets series that produced Allen Ginsburg’s Howl.